Peterborough United manager Steve Evans believes squad strength won the day for his team at Southend today (September 8). Substitutes Ivan Toney, Marcus Maddison and Joe Ward all came off the substitutes’ bench to make an impact on a 3-2 win. Toney claimed the winning goal after fine work from Ward two minutes from time. Unbeaten Posh are now two points clear at the top of League One ahead of a big clash with second-placed Portsmouth at the ABAX Stadium next Saturday (September 15). Pompey are also unbeaten. Ivan Toney jumps for joy after scoring the sinning goal for Posh at Southend. Photo: Joe Dent/theposh.com. 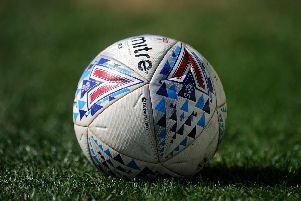 Posh had led 2-0 before Southend hit back with two goals in 12 second-half minutes, a period Evans described as ‘chaos’. Posh have now won six of seven League One matches. This was a fourth away win out of four. “We were comfortable for 70 minutes and deservedly led 2-0,” Evans stated. “But 12-15 minutes of chaos got them back into the game. We defended poorly in that spell, but what a response from the team after that. “I am comforted by looking across at my substitutes bench and seeing players of the quality of Ivan Toney, Marcus Maddison, Joe Ward and George Cooper sitting there. Ivan Toney converts the winning goal for Posh at Southend. Photo: Joe Dent/theposh.com. “They are players that would start every week in a lot of League One sides and it shows what strength in depth we have. “I’m delighted for Ivan. He missed a few chances at MK Dons the other night, but I told him to keep his head up as chances would keep coming and no-one was going to stop him scoring that winning goal today. The build-up was excellent also. “I sent Joe Ward on to give the Southend left-back something to do other than attack and it worked a treat. “It’s a big win for us. I don’t care how many players Southend had missing, this is a tough place to come and win. “We have great reslience in this group. Their goals could have been avoided, but once we got back in front they didn’t create another chance. Posh gave a full debut to on-loan Jamie Walker today with Ward dropping out of the starting line-up, the first change Evans had made for a League One match this season.